I was positioning my sunglasses so that the top frame would be right were the sun was, and then I slowly tilted my head downward to match the rotation of the earth. 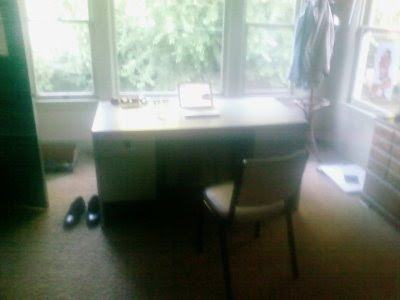 this is huge: I got a desk. Seated there now and it feels so right. We went to Hells Canyon, or Hells Crayon as I took to calling it. It was vast and secluded. The first night we slept on the rim, wind blowing through tall pines, no one within maybe 50 miles. I started a fire and nursed it for a while before hitting the sack. I kept throwing sticks for the dog and he leaped through the high grass like a deer in wheat and fetched them. He also thought I was taunting him when I stirred the fire with a poker. He is insufferable. Hells Canyon, for those not in the know, is the deepest canyon in North America! We slept in Idaho for a night, where P and dog almost got eaten by an angry pit-bull and its rude owners. Oh, speaking of, I read Hannibal Rising, one of the prequels to Silence of the Lambs. It was a decent enough book I guess. The words were really far apart so it was really quick to read. Then I started a book by Cormac McCarthy, Cities of the Plains I think it's called. It was the third book of a trilogy, the first two of which I'm not familiar with. I started it, not having any other reading material other than some Vogues that P had brought along, and hopefully the novel will stand alone well enough. Anyhow, the words in that book were closer together than the Bible, and he didn't use quotation marks around the dialog, which was a little discombobulating. Reading authors who are alive is really abnormal for me. I also didn't learn about Nirvana until 1996. Yesterday I swam naked around an island, pushing p and dog on the air mattress that we slept on and slept well down in the canyon. Dog sleeps in the car on these trips and he was very tense on the water. He wants to jump in he just doesn't know how to go about it. I varied the depth of my bum based on how close the wake-board boats got. One boat did a lot of hollering but I just think that their wake-boarder probably did a nice maneuver. We saw an appropriate amount of Hells Canyon. Enough that we'll hopefully not have to go back. It's about 8 hours both ways. I found my sunglasses on this rock in the canyon where I had been perched the night before. It felt like a miracle. I went from being totally pissed off and frustrated at not being able to find them to the most uplifting, high feeling when I saw them sitting there. I was happy that no billy goat had walked off with them. We also saw two dams. I walked on one of them and heard the electricity being generated. It was quickly whisked away by huge power lines. There were enormous carp swimming around the dam too, but fishing was disallowed. We didn’t take a jet boat tour, but I was tempted for about 10 seconds to look into it. I have 5 rolls of film to take in, some of it from over there, other shots will be a surprise to get back; I seem to have forgotten when and what and why I clicked the button. This afternoon I tried to stoke the flames of my skateboarding and it went ok. I usually just go to a certain low-impact site, but today I rode the bike around and visited spots that I visited as a 16 year old, and not much had changed. The ground was rougher, the apartments re-modeled, and my old bones achier, but otherwise it was basically the same. Skate and Destroy. Oh snap, achier isn't flagging the spell-checker. Time to quit while I'm ahead. Check back soon, maybe Wednesday. oh this looks like a chill place to go rafting. we did the longest portage. Longer than this? Basically. Portaging is so hard. You'll be pulling and pulling and it's just so tiring. We were doing it barefoot because there was that kind of grass that just destroys your socks, and then we started walking and those little hitchhikers just burrowed into the bottom of the feet so we put the shoes back on. After a long portage rowing feels so easy. And after a lot of paddling a nice portage seems sort of easy. It was a really exhausting adventurous day. If you get bored you can just chase a cow. They never did touch any cows.